Coming up on June 29 is National Hug Holiday, which is a day dedicated to showing loved ones how much we care for them with a basic affectionate gesture: a hug. National Hug Holiday was founded by the Hugs for Health Foundation, and it's purpose is to remind everyone to show love, caring and affection for the people in our lives – especially those going through a tough time or having a bad day. You can probably think of several people you'll want to embrace on the fun holiday, but what should you do if one or two of the people you love the most live out of state or have passed away? Roses are practically synonymous with romantic love, especially red ones like those found in Teleflora's Thoughts of You Bouquet. Roses are one of the most popular flowers to give as gifts because they're gorgeous, classic and perfectly symbolic of a romantic relationship. If your significant other is away this year on June 29, send him or her an arrangement of roses, in whatever color you know he or she will like best. With their bright colors and unique many-petaled blossoms, mums are some of the most interesting and beautiful flowers to send to a loved one. In general, chrysanthemums symbolize optimism, a long life and joy (perhaps because it's hard not to be joyful when looking at them), but red and white mums have special meanings that are appropriate for the National Hug Holiday. Red mums represent love, while white mums symbolize loyal love. You've probably seen peonies lining walkways and filling gardens this spring – the flowers' huge blossoms and delicate petals make for a romantic appearance, and they're very popular to plant. But peonies, which represent compassion, also look perfect as part of a bouquet (they're some of the most desired wedding flowers, after all). 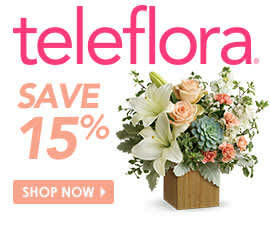 On National Hug Holiday, send your loved one Teleflora's Perfect Peonies. Bright and soft pink peonies are paired with green ivy for a simple but elegant arrangement. Hydrangeas are often used to represent heartfelt emotions and even gratitude, which makes them the perfect flower to send to a good friend any day of the year. Choose a bouquet featuring cut hydrangeas, or send a potted plant that will last much longer and bloom for years. Every time the hydrangea blooms, your friend will be reminded of why you sent it. For mothers looking to send flowers to, say, a child who's living out of state or going to school far away, carnations are the perfect gift. Pink carnations in particular represent a mother's love and many other colors of the flower have loving symbolism as well. Alstroemeria may not be your first thought when you're considering sending a bouquet, but the flower actually has a one-of-a-kind appearance and lovely meaning that makes it a beautiful gift to send. Alstroemeria is known for being the flower of friendship, so send an arrangement with the pretty flowers to one of your closest pals on National Hug Holiday. The red alstroemeria and white daisies in Teleflora's Dancing in Daisies bouquet make for a happy arrangement that will make your friend smile – he or she won't be able to help it.